If you happen to see a video of someone playing Jenga with a whip or performing tricks with a flaming fire whip there’s a very good chance it’s April Choi working the whip. 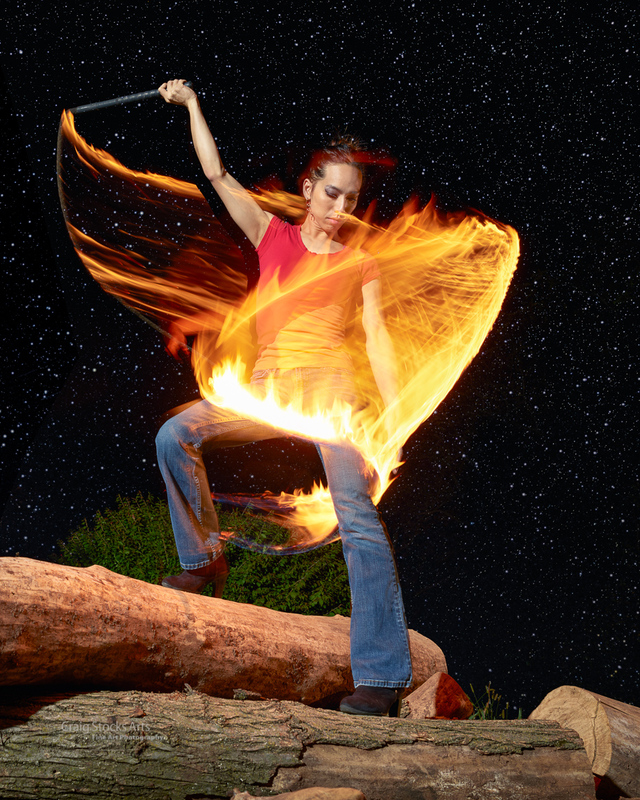 April combines the inquiring and calculating mind of an engineer with the grace of a dancer, a flair for fire and a passion for teaching to create new props and tools and teach others how to use them. April grew up in a number of areas of the country and ended up in Iowa before coming to Peoria a few years ago as a contract research engineer at Caterpillar Inc. Her technical background includes a bachelors and masters in mechanical engineering with specialties in combustion systems and computational flow dynamics. She loves to combine her engineering side with her creative energy. April’s mother started her in dance classes at a very young age as a way to keep her occupied and supervised. Later April got into ballroom and Latin dance competition and teaching before joining the University of Iowa swing club where she became known as a blues and swing instructor. April spent months finding the perfect way to manufacture ideal fire whip, and is currently working on a new project. “It starts with inspiration,” she said. “The one I’m currently working on is a dragon staff with spikes on the ends that increase the inertia to keep it spinning. The idea is that if you put a bearing on the end then the spikes can continue to rotate. So, if we use clutch bearings we can do moves that you can’t normally do with a dragon staff. “Then I start going through the design specs for the diameter of the staff, find the correct bearings, etc. I start manipulating the numbers in a CAD model and eventually build a bill of material, buy it, then build it. “Research and development is my favorite part. Once I know how to manufacture it for the least amount possible – I’m bored. I don’t like the business management, I like the project management, process control, quality control and mechanical engineering. I want to concentrate on the mechanical design,” she explained. April also puts a lot of energy into creating videos, both promotional and educational. Her promotional videos have landed her some exciting spots performing whip trick on network TV including “The Late Late Show with James Corden” and a variety show in Europe that’s broadcast to all of the Dutch speaking regions. April is certainly not standing still and she has many more exciting things to come – including some whip-related world records. Keep up with her on Facebook, Instagram and YouTube. Update – April created and posted a Behind the Scenes video on YouTube showing how we did a “Wall of Fire” photo. You can see it here on YouTube. Peoria, Illinois fiber artist Dana Baldwin has had a passion for art for as long as she can remember. In fact, her earliest memory is sitting at her father’s feet in New Orleans coloring in his medical books. Her father was an Air Force doctor so they moved quite a lot. When she was just 11 years old and living in Spain she came across an older woman “knitting the most beautiful and complicated lace pattern. It was like her fingers had eyes on the ends,” she recalled. “I was just mesmerized and I thought, ‘I want to learn to do that. '” She asked her mother to teach her how to knit, but it just didn’t seem to work. When college time rolled around she wanted to major in fiber arts but her parents convinced her to major in something more marketable which led to advanced degrees in clinical nutrition. “I had really great training, but I hated it,” she said. “I felt like an artist trapped in a dietician’s body. I worked, but my default was always art. I always wanted to get my work done so I could do art.” Eventually she quit working and became a stay-at-home mom, but was still knitting whenever she could. Dana explained that she never really felt like an artist or a designer “because I can’t draw my design, and that’s what I thought designers did.” But, when her husband suggesting entering her work in a wearable art show where they were living in Virginia she stated winning top awards. “Maybe I really do have some talent,” she realized. Back in Peoria Dana became reacquainted with the late Maryruth Gin whom she had known in high school and the two hit it off perfectly. They decided to open “The Sheared Edge” in the Sunbeam Building on Sheridan. 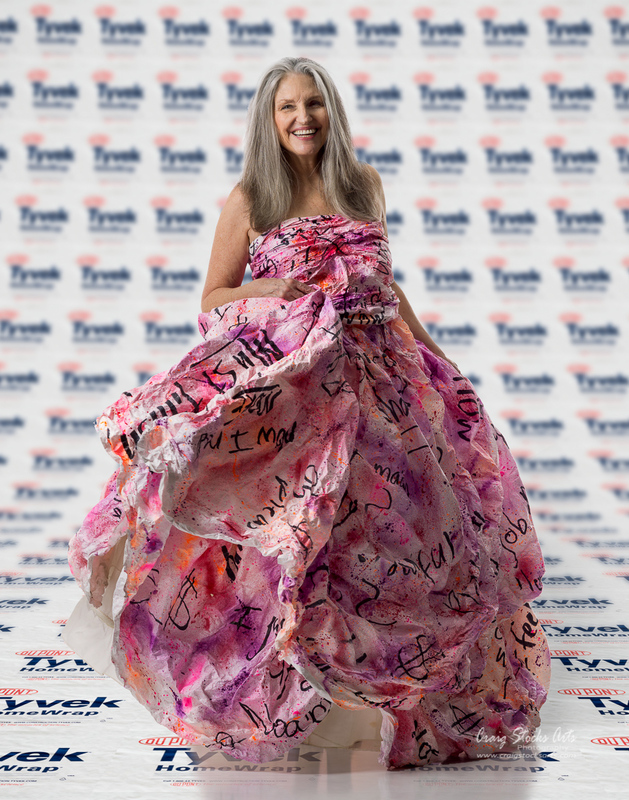 One of her favorite creations is the Tyvek dress named “Marilyn.” While in Virginia she met Marilyn, an older woman and fellow fiber artist. Marilyn created a number of unique pieces using Tyvek and showed Dana how to work with it. “It didn’t look like Tyvek but it was beautiful,” she explained. She was surprised to learn that Marilyn’s brother worked for DuPont and had invented Tyvek. For more information visit www.shearededge.com or find Dana on Facebook at www.facebook.com/TheShearedEdge. You can also visit The Sheared Edge at 925 N. Sheridan Road in Peoria Tuesday through Saturday from noon to 5:00 PM and CIAO First Friday evenings from 6:00 to 9:00. Contact Dana at dana@shearededge.com. Wikipedia defines burlesque in part as “a literary, dramatic or musical work intended to cause laughter…” and that definition certainly applies to Catharine (Cat) Littlefield and her troupe of Lock and Key Burlesque performers. When you watch her perform you’re left wondering who’s having more fun, Cat or her audience. Cat grew up in Decatur, Illinois and was involved in both visual and performance arts including training in opera performance. “I’ve been performing since I was 10 years old,” she recalled. “Performance is in my blood. My mom is a singer but my dad couldn’t carry a tune in a bucket.” She transferred to Millikin University in Decatur at the start of her sophomore year to major in music but discovered she’d have to be in choral music, “And I hate choral music!” she explained. With her love of visual art and experience with photography in high school she switched her major to studio art with a basis in photography. They evolved from “being in someone’s living room and pushing all the furniture aside” to performing at a local bar. Cat began performing under the stage name of “Kitty Catscratch – Always Classy, Never Trashy” and became completely hooked on the burlesque performance experience. “Anybody who gets up and stage and says they don’t get a rush from the audience response must be dead,” she said. After a couple years performing in Decatur and elsewhere people moved away and the original group dissolved. Eventually Cat found herself married and living in the Peoria area. She was doing burlesque parties and that led to teaching burlesque classes at California Style Fitness. 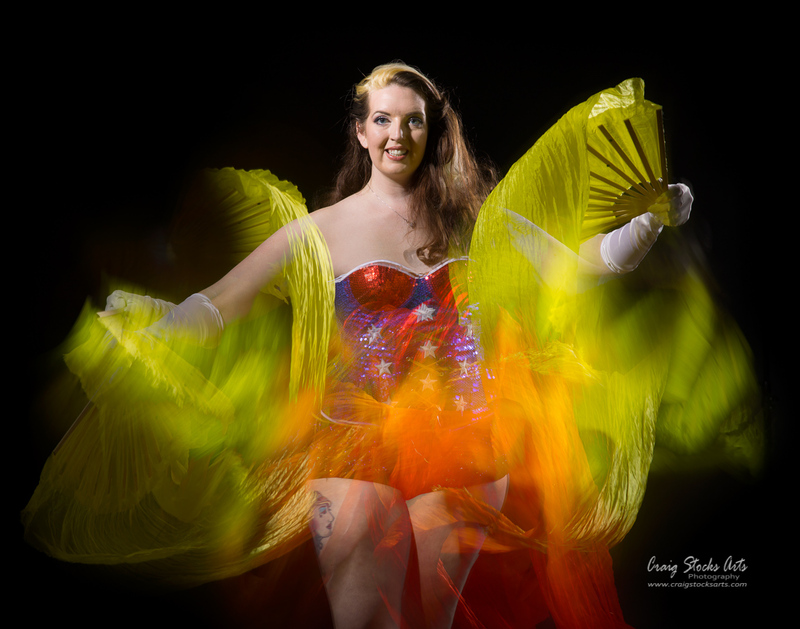 Last year she put out open call auditions for “Lock and Key Burlesque” and organized a troupe locally. The troupe has been successfully performing locally and is now planning auditions for the 2016-2017 season. You can learn more about “Lock and Key Burlesque” as well as their upcoming open auditions on their Facebook page at www.facebook.com/lockandkeyburlesque. You can learn more about Cat’s burlesque classes and burlesque parties at www.castylefitnessstudio.com. It’s normal for artists to put something of themselves into their work. 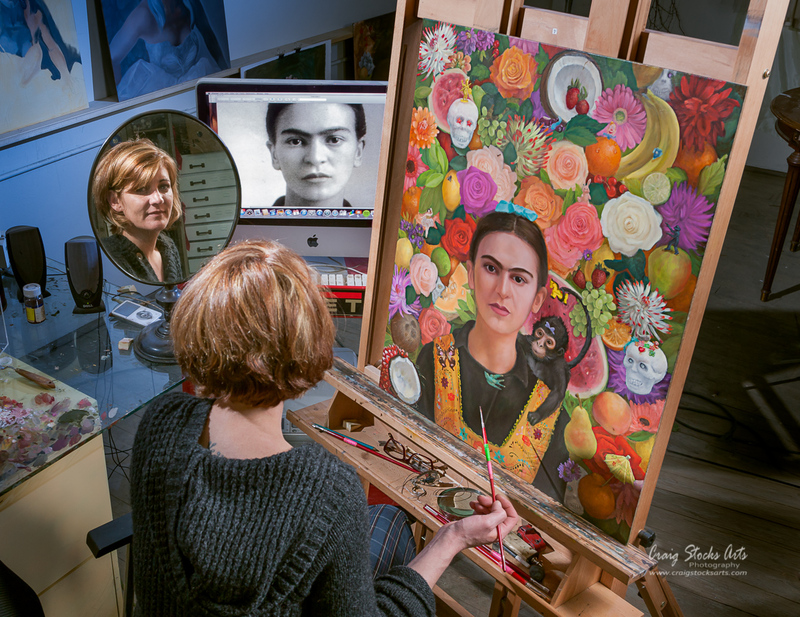 But when Peoria artist Carrie Pearce began working on her portrait of Mexican artist Frida Kahlo, she not only found inspiration, she also found that they had quite a bit in common. Carrie grew up in the Peoria area, but went to Georgia to attend the Savannah School of Art and Design. 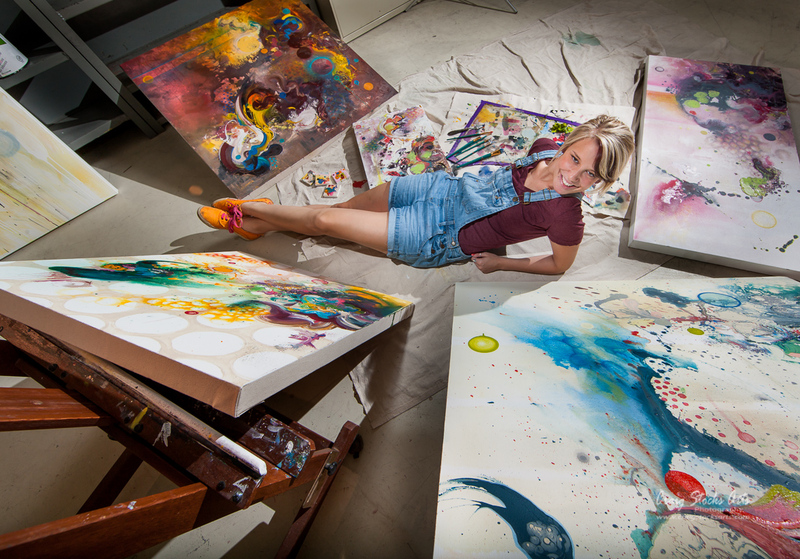 She finished her Bachelor of Fine Arts degree in just three years and decided to stay in Savannah. During the next nine years she had a successful studio in City Market where she met her husband, wood artist James Pearce. After riding out one too many hurricanes, they decided to move back to Peoria. Oil paints on board are Carrie’s medium of choice, but that was not always the case. While in Savannah she worked primarily in watercolors to create floral and garden images that were popular with tourists. She occasionally used acrylics and had begun experimenting with oils, but didn’t make the transition until more recently. One of Carrie’s first decisions was to find a source photograph for the portrait. Her choice was to use a photo that was taken just before the bus accident. “I didn’t want a famous photo that you’ve seen before,” Carrie said. The background of the portrait is a mixture of flowers, fruits, toys and animals. “Frida painted a lot of fruits and flowers, so that became the natural background.” Carrie laughed and said, “And then, I have to have my toys. She should have toys.” The sugar skulls provide a nod to Frida’s Mexican heritage. Frida also loved animals, so it’s fitting that there’s a monkey perched on her shoulder, but Carrie felt the monkey should have a toy rocking horse gripped in the tip of its tail. When “Frida” is finished, Carrie has a clear vision for the frame as well. “The frame will be made from thousands of metal bottle caps – so it’s going to be even more over-the-top. It’s already busy, so why not just go all the way.” The frame, as always, will be custom built by husband James. You can find more information about Carrie and her other works at carriepearce.com. You can meet Carrie and see her work in person at The Atelier, 1000 S.W. Adams St. in Peoria during CIAO First Friday Studio Tours. Peoria sculptor Cyndi Merrill always loved creating art but she assumed that she’d be involved in engineering of some sort. That all changed when she took a design class at Illinois Central College, and that experience set her on a path for a bachelor of fine arts degree from Illinois State University. Her breakthrough piece came during her design class at ICC. For a covered object assignment, she created a sperm bank by covering a piggy bank with hundreds of tiny hand-made sperm. “It was fun and conceptual,” she said, “and I got it into the collegiate art competition for two-year schools. That was kind of a big deal since I was the first person from ICC to get into the competition.” With that validation, she turned her focus from engineering to art. Her BFA is in fine art ceramics and she has a second degree in studio arts. The octopus portion of the figure is a recurring theme in much of Cyndi’s work. Cyndi suffers from nerve damage, possibly caused by Lyme disease. “I choose the octopus while I was doing water therapy,” she explained. “It’s something that feels as free and awesome as I do when I get into the water. The octopus doesn’t have the restriction of bone and sinew to keep it from moving, so it has the ultimate freedom of movement. Then, I combine it with a sublime body (sublime meaning “perfected body”) as the idealized female form combined with the idealized figure of free movement. “I put them together so that you have the desire to look, but we’re puzzled to make a connection,” she continued. “The connection is important to understand; you may start to wonder what it is that makes you want to look. You can find more information about Cyndi and her other works at thecrabbyrabbit.com. You can meet Cyndi in person and see her work in person at The Atelier, 1000 S.W. Adams St. in Peoria during most of the CIAO First Friday Studio Tours. However, this Friday, November 7, 2014, she’ll be part of the “Peoria After Dark” exhibit at Studios on Sheridan in Peoria. I’m sorry to say that I will no longer be able to continue making regular posts on “Playing Peoria.” I’ve truly enjoyed meeting each and every one of the artists and performers who have shared their art with us. The Playing Peoria website will continue to be available online, and I do hope to make periodic posts in the future. Click on the “Follow Playing Peoria” button to receive an email notification of any future posts. You can also learn more about me and my photography on my website, www.craigstocksarts.com, and visit my personal photography blog at www.craigstocksarts.com/blog. I specialize in medium and large prints of my landscape and fine art photography. Prints are available through a number of local outlets, including Studios on Sheridan, Studio 825, the Joseph Works Art Gallery, The Main Statement, and the Traffik Jam, as well as directly from me. Local artwork is the perfect way to decorate your home, office or restaurant. Thanks again to all of the artists who have participated in Playing Peoria. I also want thank the people who have helped me produce and promote Playing Peoria. Peoria artist and Bradley University fine art student Britni Ulrich came to Bradley to learn about art. In the process, she began to explore dichotomies, and learned a lot about herself. After high school, she was attracted to Bradley because of their art program. “They have a great painting program and I like how it’s intimate. I knew I’d get a great education and they’d push me to the right level I needed to be.” Though she originally considered pre-med, she decided that art was too important to her. That prompted her to switch to art education, but eventually her professors convinced her to apply to the BFA program. For more information, visit Britni’s website at www.britniulrich.com. Enter your email address to follow Playing Peoria and receive notifications of new posts by email.